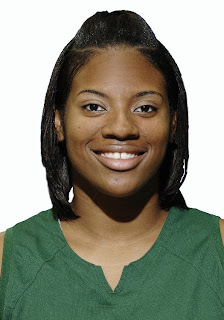 Former Charlotte 49ers women’s basketball standout center Danielle Burgin has signed a pro contract with Bulgaria’s Dunav Ecount Rouse team. Burgin played a major role in helping the 49ers win their first Atlantic 10 conference tournament title last season and second NCAA bid. Last season, Burgin became the 16th player in school history to score 1,000 career points and she is one of only five players in school history to score 1,000 career points and grab 800 career rebounds. Burgin was a three-time all-A-10 selection and the first Charlotte player since Markita Aldridge to be named all-conference three times. Last season, she finished second in the A-10 in rebounding (9.2 per game) and was third on the team in scoring (11.1 points per game). She joins Aldridge, Alicia Abernathy, Pam Brown, Sakellie Daniels, Jameka Jones and Monica League as former 49ers that have played professional basketball. Way to go Danielle. Hope you get one of those SugarDaddy owners like the one in Russia that "takes care" of his players. Taurassi says it's not so bad. If not, Bulgaria is only cold during the winter and a great place to earn a living. Just watch out for the Gypsys.